Manson Construction, headquartered in Seattle, Washington, faced a big problem when the California Air Resource Board (CARB) began demanding that engine operators operating in southern California provide fuel consumption data on which the board could calculate emissions. 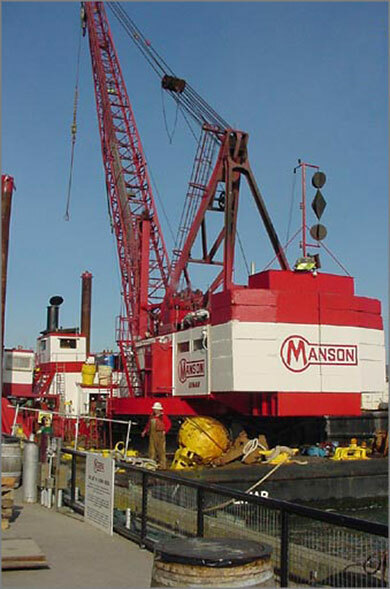 Manson is a family-owned company that has specialized in heavy marine construction since its founding in 1905. 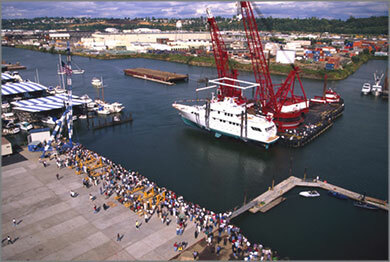 The company does dredging and heavy lift crane work, and also builds docks, piers and bridges. It currently operates 26 derrick barges, 4 hopper dredges and 2 suction pipeline dredges, which are used to dredge the seabed and pump the resulting mud to a fill site. In addition, the company maintains a fleet of about 18 miscellaneous vessels that include tugs, crew boats, survey boats and service vessels. It’s a business that demands lots of horsepower. Manson operates up and down the West Coast of the United States, in the Gulf of Mexico out of its Houma, Louisiana office, and on the eastern seaboard. The bulk of its work, and equipment, is on the West Coast. And a large percentage of that is in California. According to Charlie Butcher, master mechanic at Manson’s Richmond, California office, which serves the entire San Francisco Bay, the CARB reporting requirements presented a special problem for Manson. “We had to get permits for every diesel engine that we had that we would want to run in Los Angeles. They gave us a permit, but on that permit it states that we have to provide them with exactly how many gallons of fuel each engine used so they could multiply it and come up with a NOx that we have actually produced by running that engine.” Butcher said that the volume of work Manson performs in the southern California area means that at one time or another all of its equipment can expect to see duty there. Therefore, Manson’s strategy was to maintain certification on its entire fleet. “If we don’t do that, what will happen is they will suspend our permit, and then there is a great possibility that to get permission to run in Los Angeles again, we’d have to put in all new engines,” Butcher said. To help them achieve that goal, they turned to FloScan Instrument Company, Inc. of Seattle, Washington. FloScan manufactures a line of fuel monitors that offer a convenient, economical solution to Manson’s reporting needs. Installation of a FloScan fuel monitor on each engine has allowed the company to easily file its required raw fuel consumption numbers on a monthly basis. To date the company has installed over two dozen systems, and it intends to install more over time. Manson depends heavily on diesel power. “Every vessel has at least two diesel engines, for sure,” explained Butcher, “and most have three or four.” Others have even more. The Viking, for example, which is a clamshell bucket digging machine for dredging channels and harbors, has a total of seven engines. “It has one main generator set and one auxiliary. The main generator is a Cat 3406, and the auxiliary is a Cat 3306. It also has a deck winch setup with a Cat 3306. Then it has what we call a spud winch with another Cat 3306 and another deck winch with a direct injection Cat 3306. The two anchor winch engines, or spud winch engines (as we call them) are 8V-71 Detroit Diesels. The main hoist engine, the engine that pulls the bucket off and makes the machine dig is a mechanically injected Cat 3512 rated at 1200 hp,” Butcher said. It’s especially challenging to report the fuel consumption on individual engines in Manson’s fleet, Butcher said, because of the design of the vessels themselves. The difficulty, he said, is that all of the engines on each vessel are fueled from a common day tank located deep below deck. Installation of the FloScan systems has become a routine procedure for Butcher’s mechanics. The first installation took them about 40 hours to plan and install. He said that is probably longer than it would take to install a system on most engines because of the tight space limitations around the onboard tanks and the complexity of the multi-engine fuel systems. “If you’ve got a real clean system and it’s an easy installation, you could put one on in a day,” he said. After more than two dozen installations, his mechanics are now familiar enough with the system that they have developed a routine procedure that runs with almost assembly line precision. “The best we’ve done is put on three in one 13-hour day,” Butcher said. He said the quality of the instructions and other documentation that comes with each monitor played a role in its ease of installation. He claims that he’s qualified to make that judgment. Having served on U.S. nuclear submarines, he has seen a lot of documentation, both good and bad. The FloScan fuel monitor is deceptively simple in appearance and operation. It displays the current engine rpm and the current fuel consumption in gallons per hour (gph), as well as the total amount of fuel used since the last reset. It also displays the number of hours the engine has run since the meter was first installed. That number can’t be reset. Manson’s crews read the meter once a day, and then reset it making it ready for the next day. So far, Butcher said, he’s experienced only one problem with a FloScan system, and he said he caused that himself by pulling too hard on a wire harness at the back of the instrument. “FloScan sent me a new harness immediately. I’ve actually had absolutely no problems.” He said that when he has had to call FloScan for technical support, he has received the information he needed very quickly. He said that in addition to providing reportable fuel consumption data, fuel consumption monitoring offers a side benefit that should prove increasingly valuable over time. As data on a given engine accumulates, he said, it will be easy to spot fuel consumption variations that could provide early warning of impending problems. Butcher said that Manson’s relatively modest investment in its FloScan meters has worked out very well. He said it has generated a massive return, because without it Manson could not continue to run in the state of California without expensive engine repairs. Manson has plans to continue using the meters as longs as they need to report fuel consumption, which is required even on new engines.